One topic not covered in this blog yet, is the Genesis clan, and their atchetype, regalia. Our main boss, the CEO of genesis herself, Regalia of the Cosmos, CEO Yggdrasil, and her mate Regalia of Fate, Norn. [AUTO](VC): [Soul Blast 6] When this unit attack a Vanguard, if this unit is in Legion, you may pay the cost. If you do, until end of that battle, this unit gets [Critical]+1, and your opponent cannot call Grade 1 or greater units to (GC) from his/her hand. 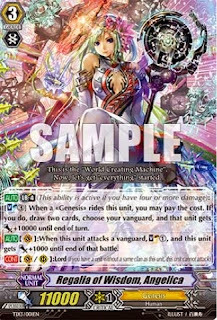 [AUTO](VC): When this unit attacks a Vanguard, if you have another unit in the center column, this unit gets [Power]+3000 until end of that battle. Regalia of Prayer, Pray Angel: [ACT](RC): [Put this unit into your soul] If your Vanguard is in Legion, Soul Charge (3), choose your Vanguard, and that unit gets [Power]+5000 until end of turn. Mirror Regalia, Achiles: [AUTO] When this unit is placed in the drop zone from your soul, choose your Vanguard with "Regalia" in its card name, and that unit gets [Power]+5000 until end of turn. 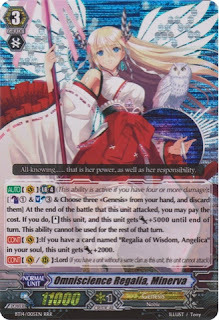 Regalia of Purify, Pure Angel: [AUTO]: [Counter Blast 1] When this unit is placed on (RC), you may pay the cost. 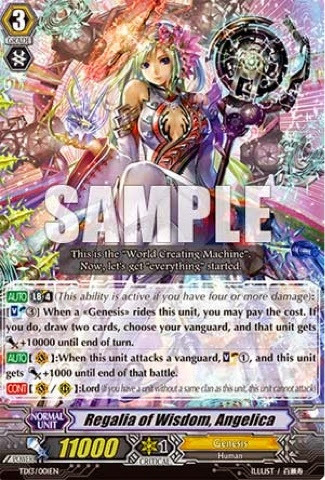 If you do, choose your Vanguard with "Regalia" in its card name, and until end of turn, that unit gets [Power]+5000, and "[AUTO](VC): [Soul Blast 3] When this unit's attack hits a Vanguard, you may pay the cost, if you do, draw a card. These are the various supports that allow CEO Yggdrasil to gain so much power. Norn and Achiles' skills can be easily activated when Yggdrasil uses her skill to Soul Blast (6). Combining that with Pure Angel, we're possibly looking at 58k power with 2 Critical, without a Vanguard booster. This element of being able to easily power up, and have a critical effect is what makes CEO Yggdrasil so threatening, and hence Genesis' main boss in the current Legion meta. 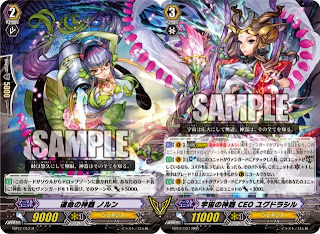 Regalia of Midnight, Nyx: [ACT] Legion 20000 "Regalia of Midday, Hemera"
[AUTO](VC): When a card with the same name as a unit on your (VC) is placed in your drop zone from your soul, if this unit is in Legion, this unit gets [Power]+5000/[Critical]+1 until en of turn. This ability cannot be used for the rest of that turn. [ACT](VC): [Soul Blast 3] If the number of cards in your hand is 3 or less, draw a card. This ability cannot be used for the rest of that turn. The Legion skill seems abit hard to pull off at first glance, but remember the specific Regalia support like Hemera and Shiny Angel. 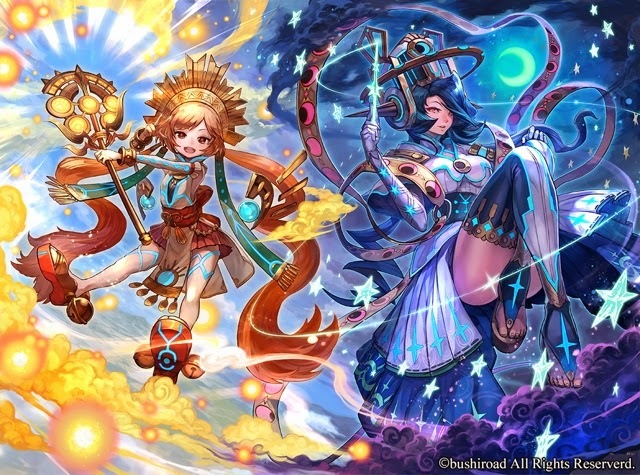 These 2 units can get either Nyx or Hemera into the soul, and then you can use Nyx's ACT ability to place one copy of either herself or Hemera from the soul into the drop zone. Of course it's risky to have 3 or less cards in your hand at any given time, so this may not be a very good card to work with.